Our online help service is available to answer your question. Please don't mention your account numbers or any critical data at this point, and only if you're asked by Amundi Client Service. The personal data collected above are intended for AMUNDI ASSET MANAGEMENT and are for the sole purpose of enabling you to receive a response to your request for information. AMUNDI ASSET MANAGEMENT undertakes to keep your personal data for the duration of our exchanges. In accordance with the European Regulation on the processing of personal data (RGPD 2016/679), you have the right to access, rectify, and delete your data by writing to AMUNDI ASSET MANAGEMENT BSC/SEC/PCA - 90, bd Pasteur - CS 21564 - 75730 Paris – FRANCE or by e-mail to dpo@amundi.com. By checking the box above, you declare that you understand and accept these conditions. +1 Added to my documents. Please be aware your selection is temporary depending on your cookies policy. This part of our website is for the attention of “Professional” investors. In the European Union, it is not for non-professional investors as defined in the MIFID or in each local regulation for the general public and nor for "US Person". This website is solely for information purposes. There is no guarantee that any targeted performance or forecast will be achieved. Amundi owns the copyright and all other intellectual property rights in the website. Since mid-2014, the ECB took several bold unconventional monetary policy measures (negative deposit rate, massive asset purchase programme). 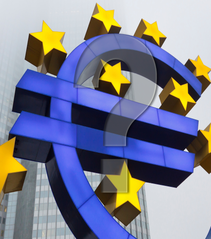 However, the weakening of the inflation outlook will prompt the ECB to take further easing measures on March 10. The ECB already did a lot. The tools it used until now are reaching or are close to reach their limits and the collateral damage are increasingly significant. Against this backdrop, it seems desirable that the ECB uses new tools or that it passes on the baton to governments. Since mid-2014, the ECB has taken unconventional monetary policy measures on an unprecedented scale. It has introduced a negative interest rate on excess reserves held by banks (reduced twice, down to -0.30%). It has also undertaken an asset purchase programme totalling €1 500 billion and granted very long-term loans to banks. However, on several levels, things look just as bad for the ECB as they did in January 2015, when the Public Sector Purchase Programme (PSPP) was announced. Long-term inflation expectations have sunk to a new low—professional forecasters put inflation at just 1.6% for 2018—and the euro’s effective exchange rate has returned to levels seen in late 2014. Obviously, things are not all doom and gloom. We are seeing a slight acceleration in private sector lending, especially when it comes to consumer credit. But the ECB has already done a great deal, and it’s reasonable to wonder whether it might be running out of leeway. The ECB’s new announcements will not trigger another major downward trend for the euro. It is clear that the ECB’s negative deposit rate and QE have weighed heavily on the euro over the past 18 months via portfolio flows. Since the ECB’s deposit rate moved into negative territory (June 2014), investors outside the eurozone, especially a number of central banks in the emerging countries, have been net sellers of European bonds (€219 billion for all of H2 2014 and 2015 as a whole) in their efforts to jettison negative rate bonds. Yet it is mainly European residents, en masse, who have regularly been net buyers of foreign bonds (€535 billion for all of H2 2014 and 2015 as a whole). A portion of the European investors who have sold sovereign bonds to the ECB have been looking for yield beyond Europe’s borders, presumably in the United States. 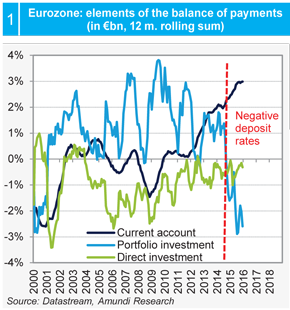 Ultimately, net portfolio flows have been very broadly negative for the eurozone over the past 18 months and have offset the eurozone’s very large current account surplus, the highest in the world in nominal terms (€502 billion for all of H2 2014 and 2015 as a whole). Thus, the ECB’s zero-rate policy has clearly allowed the euro to avoid appreciating, but it seems highly unlikely that a new downward trend will start for the euro, with new easing measures on the part of the central bank. As evidenced by the market reactions to the Governing Council meeting in December 2015, simply extending the theoritical end of the PSPP and lowering deposit rates again is not enough in itself to send the euro down, or, for that matter, to push up long-term inflation expectations. To avoid another appreciation by the euro (the euro’s effective exchange rate, as monitored by the ECB, gained 4% between early December and late February), the ECB is, in a way, forced to increase the pace of its asset purchase. 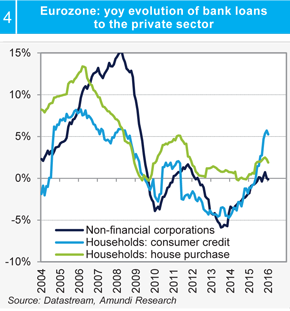 Though it does appear very likely that the pace of purchase will increase, it should also be noted that the ECB’s asset purchase programme is already considerable in scope. 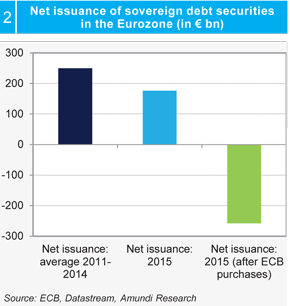 Over 2015, the net issuance of eurozone sovereign bonds stood at €177 billion, while the ECB bought €434 billion. Bond purchases correspond to about 250-300% of net sovereign bond issuance (depending on the month), while the Fed’s purchases of Treasuries were only 50-60% of net issuances. Otherwise, the ECB’s QE is extremely powerful for the bond markets, and puts strong downward pressure on long-term rates. In addition, the fact that German long-term rates are too low is clearly a problem for German banks and insurance companies. The ECB is well aware of this; how else should one interpret the December decision to expand the PSPP to include the regions’ debt securities? 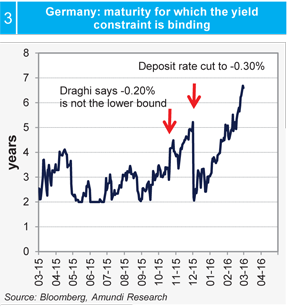 Indeed, Germany is the only country really affected by this measure, which eases the heavy downward pressure on German long-term rates. As we explain in the box thereafter, the several constraints of the PSPP raise clearly the question of the availability of German and supranationals securities in order for the ECB to complete what it has already announced. So, in addition to buying more, the ECB should change the make-up of its asset purchases. Re-routing purchases away from the capital structure would help solve this problem. But the political cost of this solution remains high. a issue share limit : the Eurosystem will not hold more than 33% of a given security. 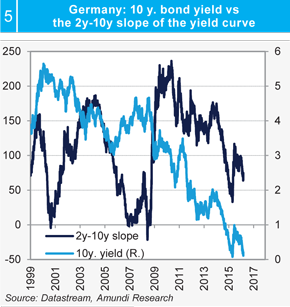 In the case of Germany, the sharp drop of the short-end of the yield curve drastically reduced the amount of PSPP-eligible securities. At the beginning of March, the maturity for which the bonds respected the yield constraint was 7 years, i.e. just below the average maturity of the Bundesbank purchases since the start of the PSPP. Simulations that we made in early March show that an increase of €10 bn/month in PSPP’s pace without cut of the deposit rate (and by making the unrealistic assumption that bond yields would remain constant) would make the PSPP impossible for Germany in early 2017. In the case where the deposit rate would be cut to -0.40%, the PSPP would become possible for German securities until mid-2017. Note that this would be approximately the same for supranational institutions’ securities and that Germany plus supranationals represent more than a third of PSPP purchases. Businesses that issue on the IG euro bond market already enjoy very attractive financing terms. Unlike the SMEs, which were harder hit by credit rationing, euro issuers have had very favourable financing terms in recent years. These companies have taken advantage of strong investor appetite paired with historically low rates to extend the maturity on their debt and significantly reduce their financing costs. Eurozone businesses now make up no more than 61% of the IG euro market. In a low-growth environment, their financing requirements remain limited. Conversely, more and more non-European issuers (especially American) are profiting from the euro market’s attractive financing terms. There is no more than €1755 billion outstanding on the corporate euro bond market. This market is already suffering from reduced liquidity, and the ECB’s intervention would only add to the trend. For all these reasons, ECB measures targeting the private corporate bond market would have a limited impact on the real economy. This measure would lead to an excessive drop in bond yields. More importantly, borrowing conditions for SMEs would stay unchanged, such that the true objective of monetary policy (boosting loans for business) would not be met. Eurozone sovereign rates are still posting historically low levels, mainly due to the PSPP. 36% of the bond market is even offering negative yields. The rate curve is very flat. The fact that the ECB’s deposit rate is in negative territory is another problem. 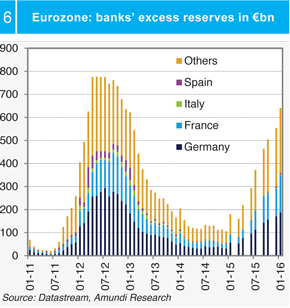 Initially, the measure was meant to encourage banks to lend their excess reserves to the real economy, rather than deposit them in the ECB. It should be noted that more deeply negative deposit rates amid a growing liquidity surplus would penalise banks’ profitability. 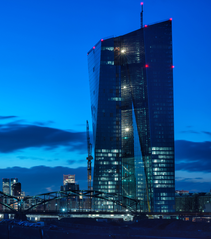 Mario Draghi has repeatedly said that the issue of banks’ profitability was not in the ECB’s purview, but that could change if the «QE/negative deposit rate» mix drives the banks to tighten their financing terms to preserve their margins. While passing on negative rates to retail customers is difficult both commercially and politically, there may be a solution in housing loan rates or surplus corporate cash. For several reasons, it seems to us that the tools the ECB has used until now are reaching or are close to reach their limits and the collateral damage (in particular concerning the impact of too low yields on the financial community) are increasingly significant. The ECB’s ultra-loose monetary policy will not, in itself, to tackle the lack of private demand in the Eurozone and against this backdrop, its actions to boost inflation is relatively limited. More than ever, one has to be very careful about the collateral damage created by these measures. 0 user(s) have answered Yes. What are the costs of these ultra-accommodative monetary policies? 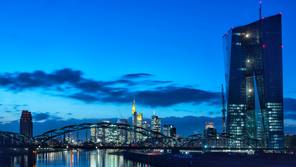 The central banks of the major developed countries embarked on ultra-accommodative monetary policies after the Great Recession of 2008 and then after the Eurozone crisis in 2011-2012. 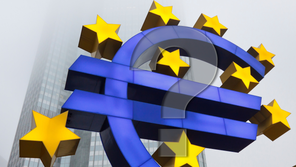 The ECB’s new strategy: which implications for the fixed-income markets? 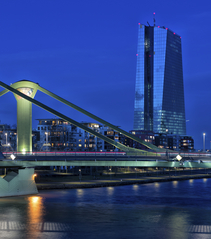 The ECB took bold measures of monetary policy easing on March 10. In this text, we aim at describing the consequences these measures will have on the bond markets. 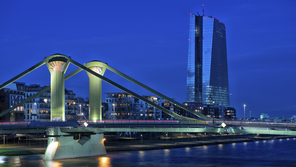 Key decisions have been taken by the ECB governing council on 8 December.